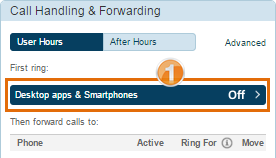 You need to add a Softphone Device to your Vonage Extension. Vonage allow up to 3 devices on an Extension. See here for details of how to do this. Account Username e.g. 7788 Extension number on ShoreTel system. Host Name E.g.10.11.12.13 IP address of the SIP Domain or Realm. VOIP is supported on a Terminal Services session. The audio (microphone and speaker) of the local PC is used via redirection from the remote session. You need Windows Server 2008 RDS or later. However, you do need to make sure you have sufficient bandwith (especially from server to PC as this has to carry video and audio now) and that the Terminal Server itself can handle the load. Bandwidth requirement for a Terminal Services session is around 30kbps and a VOIP session would usually be 16kbps or 24kbps, but could be as high as 64kbps if the G.711 codec is used. So check which codec you use for VOIP.